One of the first things people will tell you about kids is how expensive they are. It’s often quoted that the average cost of raising a child from birth to age 18 for a middle-income family in the United States is approximately $245,000. But the reality is for many families, that number is unreachable. And in fact, kids are only as expensive as you make them. When we found out we were expecting, we wanted to fall into the trap of buying everything brand new and top-of-the-line for our bundle of joy. Like most first-time parents, you want absolutely the best for your kids and commercialism has brainwashed us to believe we must spend oodles of money on children’s items—many of which are used for only a brief period of time. This is why it’s possible to buy used baby items for a fraction of the cost of retail, saving thousands of on baby expenses in the process and still purchasing high-quality stuff. After seeing how much money we could save by purchasing used, my husband and I vowed that we wouldn’t fall into the commercialism trap. Instead, we’d be smart with purchases and contribute more toward our child’s college education fund, our retirement, family savings, and investments. 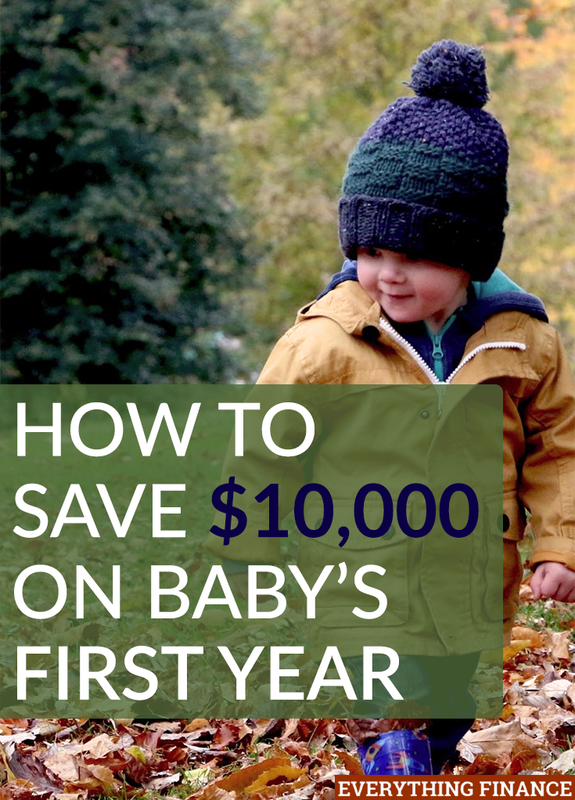 Here is how we’ve already managed to save more than $5,000 on our baby. Once we started shopping for the big ticket items for our nursery, we realized we were easily going to spend more than $2,000 on baby furniture. Instead, we decided to buy used items and search for cheaper alternatives for other items. We were able to purchase a used Pottery Barn crib for $200, down from the original $800 price tag, and we purchased a used glider and ottoman for $50, down from the original $800 price tag as well. We simply spent about $5 in touch-up paint for the crib, and $50 to get the glider and ottoman professionally cleaned. For our children’s dresser, we decided to purchase the Ikea Hemnes white dresser for $249 instead of the Babies R Us $499 Sorelle dresser I originally had my eye on. According to BabyCenter, parents can spend anywhere between $1,000 to $2,550 on diapering their child up to age 2 and a half. With an initial investment of less than $400, I have purchased cloth diapers that will last me through my baby’s potty training years, and for future babies to come as well. While many parents are worried about the time commitment, most agree that it’s not that much extra work and worth the cost and environmental savings. Clothing for babies is a place where you can easily go nuts with spending money. It’s just too cute! At the beginning, I wanted to buy ALL the clothing and didn’t care how much it cost as long as it was adorable. After I came to my senses, I realized that many of these items will only be worn a handful of times because children, especially babies, outgrow them so fast. For this reason, I had to make myself stick to the $10 rule—where I wasn’t allowed to buy a single item of clothing unless it was less than $10. I was lucky enough to be gifted lots of baby clothes, and I purchased some used baby clothing lots for about $40. I got three giant bagfuls of clothing, and I picked and chose what I liked and donated the rest. Sticking to this rule will save me hundreds over the first year. The most highly regarded daycare in our area charges $1,500 a month for infants. It may be considered “the best,” but we had a couple of issues with going this route. The first being that there isn’t much learning infants can do in daycare—they pretty much eat, sleep, and poop—is that really worth $1,500 a month? The second issue is that while we could afford this daycare, it would mean making financial sacrifices in other arenas, such as our retirement savings, investments, annual family vacations, and limiting contributions to our child’s college fund. In the end, we decided to go with a part-time sitter and family friend who charges by the day and will work with our irregular work schedule. We love the idea that our child will be getting individualized attention by someone we know and trust, and we won’t have to sacrifice other financial goals in the process. How did you save money on your baby in the first year? How do you continue to save money? Are you a fan of buying used baby items?